Super Cop! For action figure criminals, his very name strikes fear in their hearts! For life-size collectors, the very mention of his name strikes fear that a thumb or crotch will break without warning! The same applies to his vehicles, unfortunately. Dang cheap Funskool plastic. 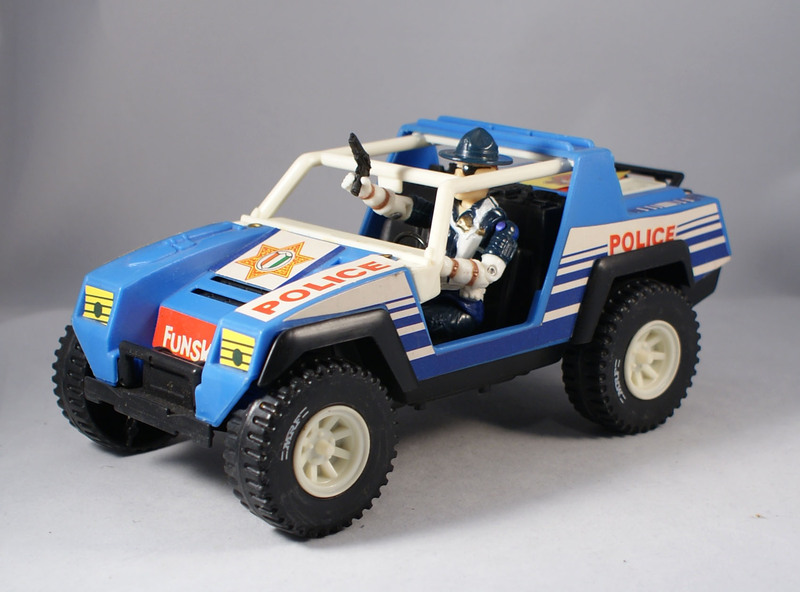 Hailing from the amazing Super Cop Rescue Squad box set, the jeep is a remold of the dependable old VAMP mold. 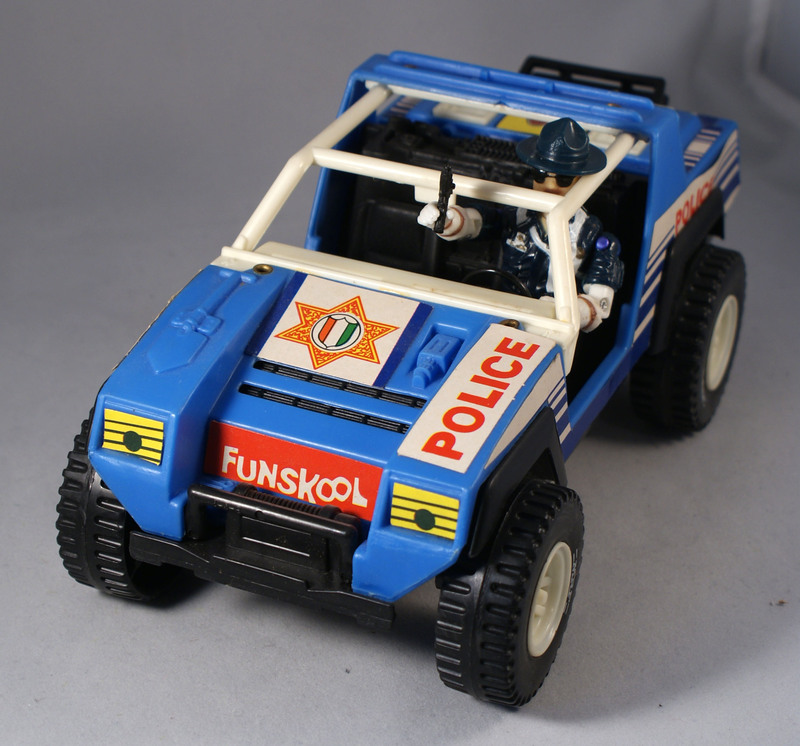 Of course, it wouldn’t be a proper Funskool remake without a few odd additions. The jeep gets a snap-on light and also some colorful but clunky paper stickers and inserts. I particularly enjoy the Funskool branding on the hood, as well as the generic “DARE” practically hidden behind the rear gas/water can cage. And you know, I always wanted one of those removable siren/lights for our family car after watching Starsky & Hutch as a kid. Unfortunately I misplaced mine for the photo shoot, but it’s here somewhere. It snaps into the center of the rear roof support, and honestly looks like more akin to some kind of inflammation than a light. Collecting the VAMP mold could be in itself a nice focus for a collector. This early Joe ride was released in a rainbow of colors, and adapted for many uses throughout the years. 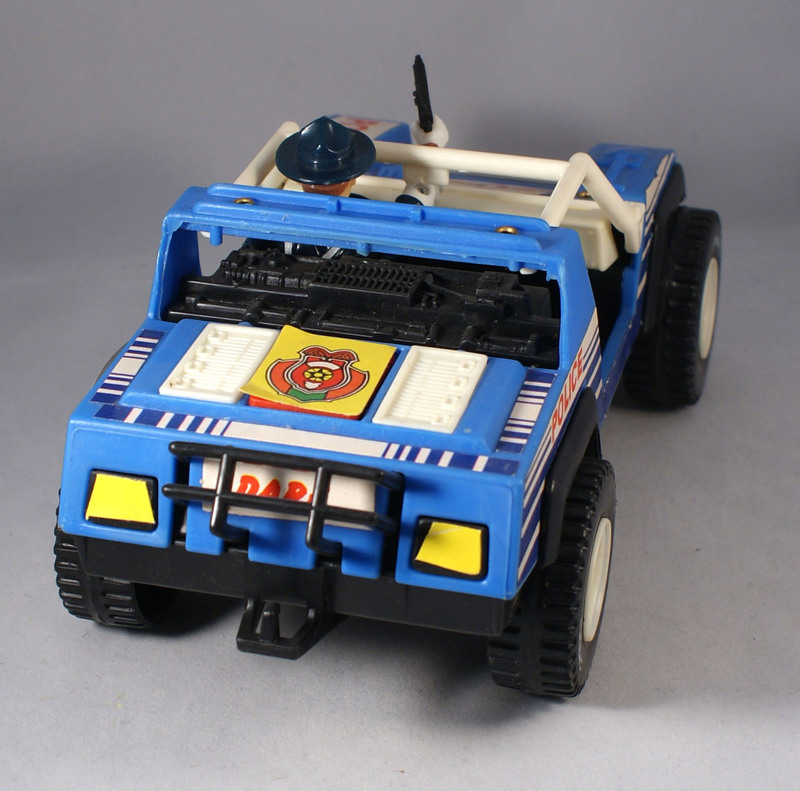 Cobra, the Dreadnoks, Action Force, the Street Fighter team have taken it into their motor pools, and Hasbro had licensed it out to several countless during the small-scale Joe heyday. It has surfaced in Collector Club convention exclusives, exclusive Toys R Us releases, and adapted to the 25th Anniversary line. I can’t help but think it would look better without the stickers. Plus, the bonus is that you get one of the SuperCop variant figures from the boxed set. This one looks pretty cool! I like the stickers too, they have a certain charm to them. Definitely an iconic mold, the VAMP. I like the blue and black colors on this one, and the white of the rollcage is neat too. MRF was a rubber company, cool easter egg. I like that Funskool rivited the rollbar to the hood. Just noticed this version uses the machine gun + shovel body mold! 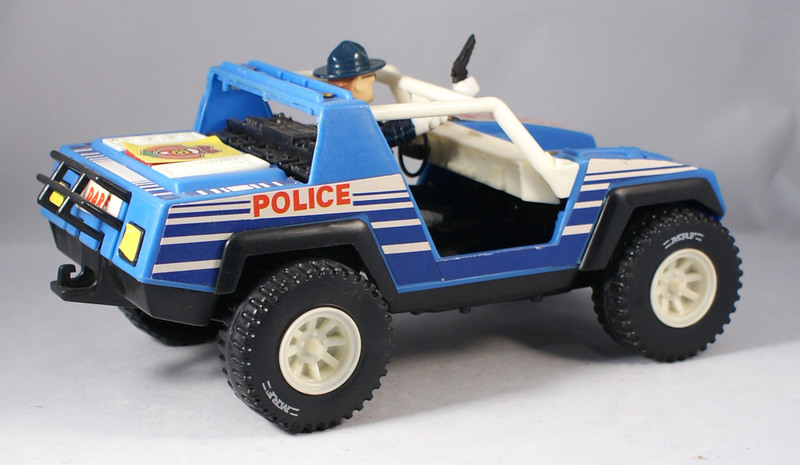 My single boxed Police jeeps just use the VAMP Mk.II mold (with no holes to clip the tarp in). I’m not crazy for Sgt. Slaughter moonlighting as a Highway Patrol Trooper, but this is a pretty cool set.